This keyboard is not supported anymore. In case there are any issues with installer, you are free to unpack the installation pack and fix those. In case you want to change the functionality, you are free to do that too. All source code is available with the keyboard. 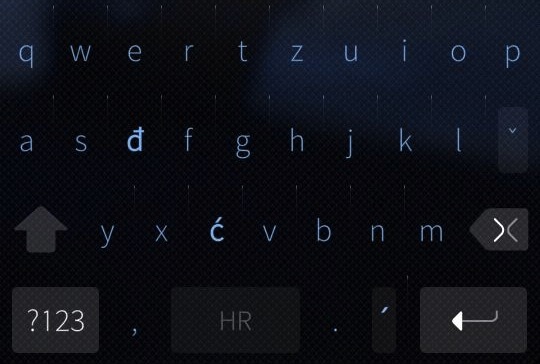 Custom Croatian (Hrvatski) QWERTZ keyboard layout to SailfishOS. Download and install the package and keyboard layout will be ready to use. Preferred installation method with Warehouse client to ensure dependency packages will be installed too. If installed manually, install latest keyboard-custom-common package first. Spacebar row deadkey location is now configurable. Press symbol key (?123/ABC) four seconds or longer and dead key swaps from left to right or right to left. Configuration is persistent and global for all Custom Keyboards having dead key on spacebar row. long press of keys c, d, s and z with opening accented character popper remains as alternative mean to type above accented characters. More optimized layout for Croatian and mobile use. Unfortunately, I can't make any updates anymore. Codes and keyboard layouts are available in rpm packages and anyone can freely make on update and publish that. If you do so, please let me know and I can put a link to the updated package so that others looking the keyboard from here can find it too.